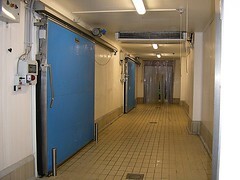 Cold rooms, cold storage rooms and insulation for the food industry. Our work and the quality of materials have enabled us to operate in all sectors where insulation, energy saving, hygiene and flexibility are basic elements for our customers' value. The know-how developed and applied, as well as the the process automation, make the FRIGOR-BOX products the right answer to your needs in the information tecnology era. WHAT DISTINGUISHES A FRIGORBOX PROJECT? Every single work comes from a site measurement, a detailed as-built drawing and a manic care of the assembly details. 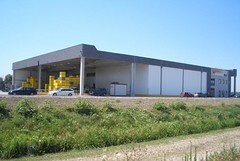 TheI materials delivered on site are ready for the installation and do not requrire any further site processing. The corner panels are made of one piece under press to a height of 6 m.
The insulation and cladding of pillars and beams are made in our factory, thus ensuring a quick assembly and a perfect completion, hardly feasible by workers on site. All panels and junctions are designed for REFRIGERATION and do not have thermal bridges, moreover they offer the highest certifications and standards as far as hygiene and self-extinguishing characteristics are concerned. The design, production and assembly phases are certified as per quality standard UNI EN ISO 9001:2008. The big production capacity and the company policy of "MAKE IN" allow us to carry out each and every job in the quickest possible time.